We have come to the end of our Lenten journey, which also means that we have come to the end of our series of Gospel stories from John. In succession we have heard the story of Jesus' visit with the Pharisee Nicodemus, who visited Jesus at night; then Jesus’ encounter with the Samaritan Woman at the well in the bright light of mid-day. What a contrast John gives us with these two stories – the insider Nicodemus who is really an outsider because he does not believe and who comes at night which represents to us that he is in the darkness; and the outsider Samaritan Woman who is really an insider because of her belief and whose encounter occurs in the bright light of the day to represent that she is of the light. Then the man born blind – who has been in darkness all him life – is given sight and he becomes a child of light because of his belief while the Pharisees and officials who can see (technically) are the ones who are really blind and in the darkness. Throughout these stories in John we can see the important themes of light and darkness, which was first presented in the prologue (John 1:1-5). The children of light are those who believe; the children of darkness are those who do not believe (1:12-13). The key to all of these stories is “belief.” And please note – in John (like in the Old Testament) the noun form (belief) is never used – to believe is always a verb. It always involves action and response and commitment. It is never static; it is never cerebral; it is never an intellectual exercise. Belief in Jesus as the Messiah is a way of life. 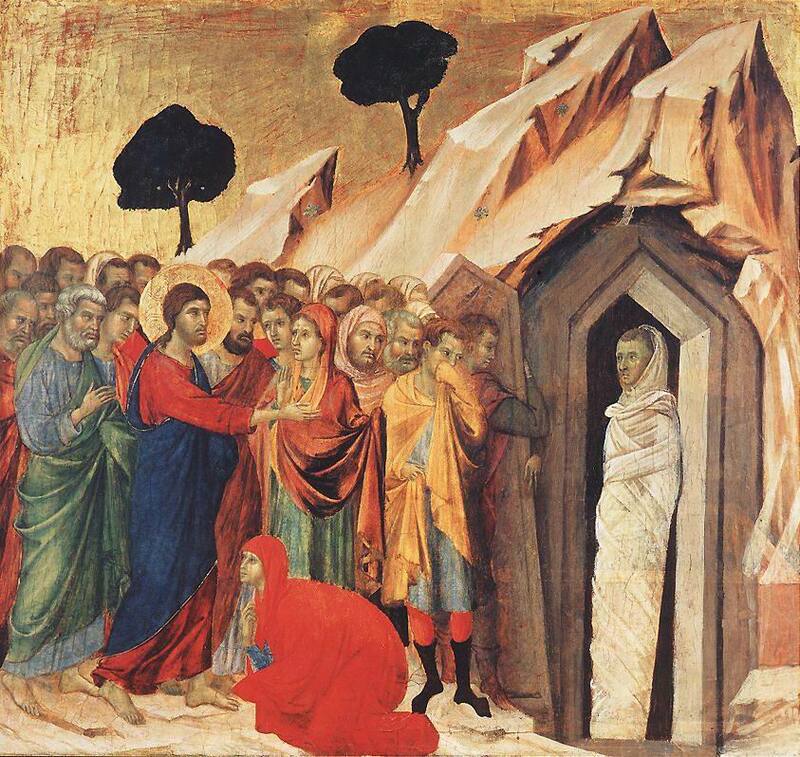 We come now to the final story in this Lenten series – the Raising of Lazarus in chapter 11. This story is the climax of the first portion of the Gospel of John, known as the Book of Signs. 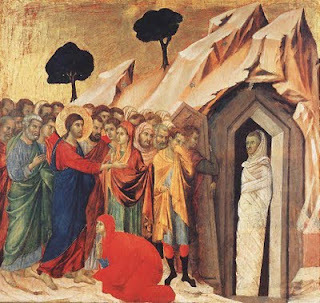 The Raising of Lazarus is the last of 7 signs that have been interspersed with dialogs and teachings throughout chapters 2 through 11. Chapter 1 was the prologue and Chapter 12 is a transition (anointing) that leads into the Book of Glory that climaxes in the crucifixion and resurrection of Jesus. 1. Jesus is met by grief-stricken sisters who reproach him for his tardiness in coming – If you had been here my brother would not have died! How many times do we feel that if only God is tardy or delayed in the way Jesus is in this story? If only you had….. – I am sure we can all fill in the blank. 2. How does Jesus respond to this emotion? Does he get angry with the women? No – Jesus weeps! (And the Word became flesh – 1:14) Jesus enters into the emotion of the women and grieves with them. 3. Jesus then brings resurrection from death. This is the glory of God, to which John refers in the prologue. By entering into the human experience God, though Jesus, redeems it from within. In other words, God brings resurrection from death, joy from sorrow, hope from despair. 4. I am the resurrection and the life says Jesus. And these things are NOW! Not off in the future in some never-never land fantasy time. Resurrection and life are NOW, though Jesus. Just as the gift of Eternal Life is NOW. 5. Unbind him Jesus commands. We are not puppets to be acted upon. God has work for us too. We are called to participate in Jesus ministry of resurrection and life. It comes around as it does in all of the other stories to belief – the verb. Do you believe? And it is not enough to say – yes, I believe; how is this faith in Jesus the Messiah manifest in your life? In what ways does God’s light shine through you? In what ways does God reach out through you to bring resurrection and eternal life to those whom you encounter? This week we pause at Bethany to consider these things before we begin the journey to the cross and the empty tomb in the weeks to come.